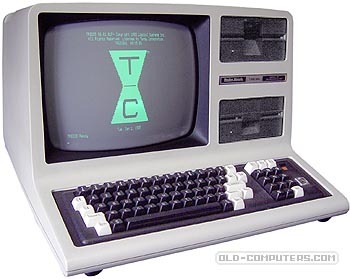 The TRS-80 model 4 (ref 26-1068/69) was one of the last models of the TRS-80 series (and perhaps the less known). It ran at 4 MHz and displayed 80 columns x 24 lines in Model 4 mode, but was fully compatible with the TRS-80 model 3 and in Model 3 mode actually displayed 64x16 and ran at the Model 3's 2 MHz. It had 64 or 128 KB RAM, the 64 upper KB being used as a ram disk. It had one or two 5.25" floppy disk (184 KB each) and ran under TRSDOS 6.0 or 1.3, LDOS or CP/M. A transformation kit "TRS80 model III -> model IV" was available. The Model 4 was followed by the Model 4D (ref. 26-1070). The only difference being double sided drives -384 KB, instead of single sided drives. A portable version of the Model IV called Model 4P (ref. 26-1080) was also marketed few time after. A graphics adapter was also available for the Radio Shack TRS-80 Model IV in 1983. It came with a graphics programming language (BASICG). I used BASICG to program a basketball shot chart program that was used for a few seasons until I finally converted it to the IBM compatible Hercules graphics adaptor that had higher resolution. It all seems pretty primitive now, but it worked great at the time. Special thanks to Charles Harris who donated us this computer ! see more Tandy Radio Shack TRS 80 MODEL 4 Ebay auctions !